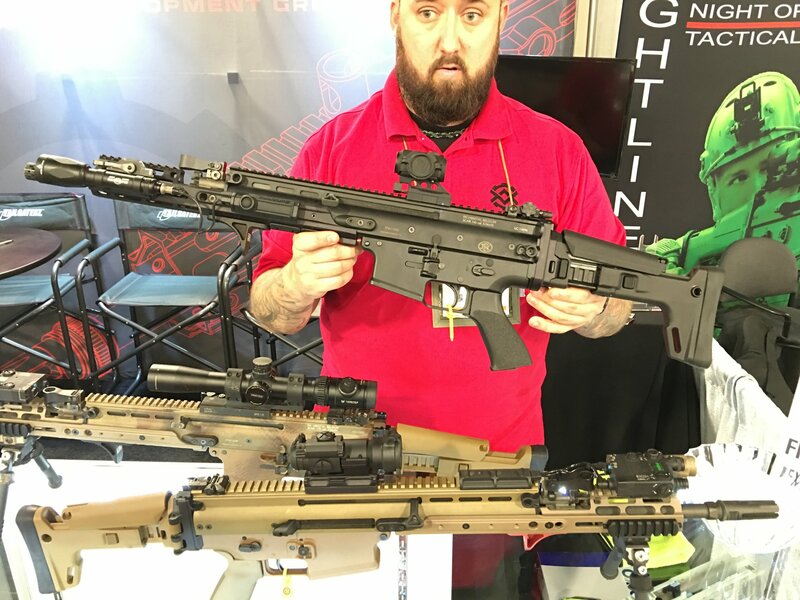 Kinetic Development Group KDG Tactical Weapons (Rifle/Carbine/SBR) Accessories for the FN SCAR Family of Weapons: Major Modular M-LOK Madness! (Video!) | DefenseReview.com (DR): An online tactical technology and military defense technology magazine with particular focus on the latest and greatest tactical firearms news (tactical gun news), tactical gear news and tactical shooting news. 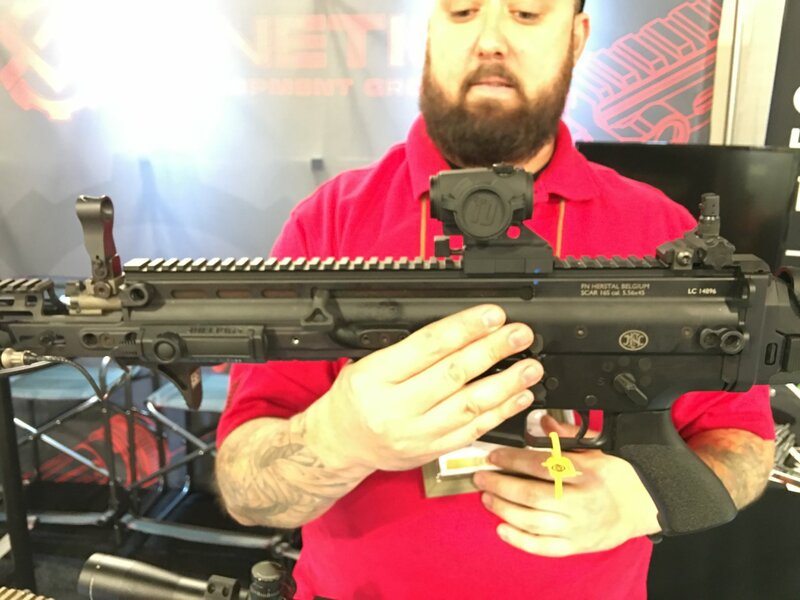 Speaking of FN SCAR-related accessories/products, we should probably also mention the very interesting ans seemingly very high-quality, highly-functional Kinetic Development Group (KDG) combat/tactical weapons accessories for the FN SCAR family of weapons, which we came across while walking the floor at SHOT Show 2016. We here at DR are primarily tactical AR guys, but we like the FN SCAR MK-17 and FN SCAR 17 series 7.62mm NATO (7.62x51mm NATO)/.308 Win. weapons, and are happy to see such nice accessories for them. So, let’s go through them. First up is the KDG MREX system. 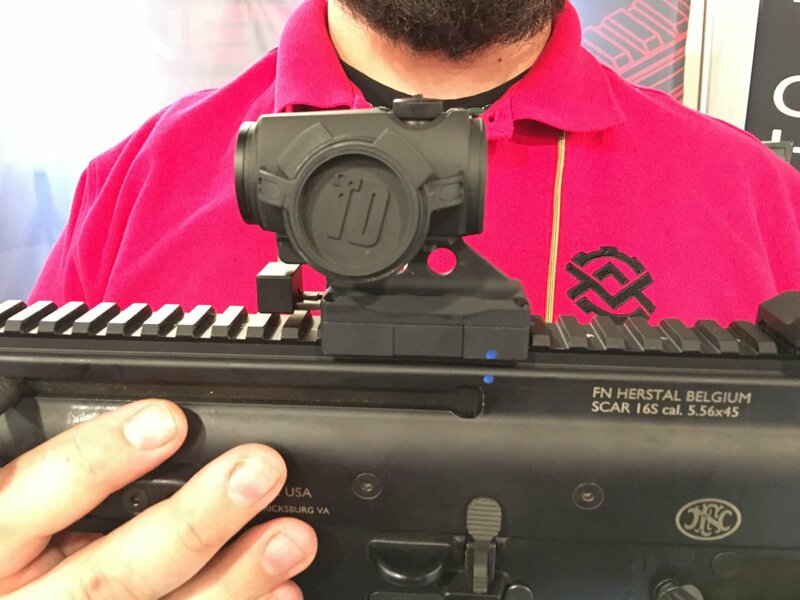 Billed as “the most innovative SCAR receiver extension ever brought to the market”, the MREX is an M-LOK modular tactical hand guard/rail system that integrates with the KDG Kinect QD M-LOK Mounts, that snap right on, easy-peasy. As if that’s not enough, Joel Townsend of KDG showed us the KDG Scarging Handle (catchy, huh?) ambi (ambidextrous) charging handle, Sidelok Optic Mount, KDG SCAR Talon Ambidextrous 45/90 Safety/Selector Switch, and KDG SAS – SCAR Adaptable Stock Kit side-folding, telescoping stock (buttstock). 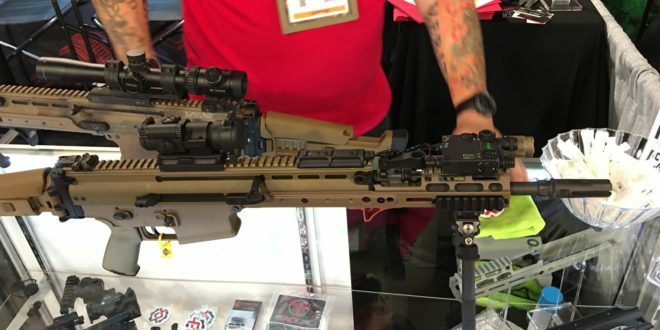 Townsend called this stock a “MagPul Masada stock” at SHOT. 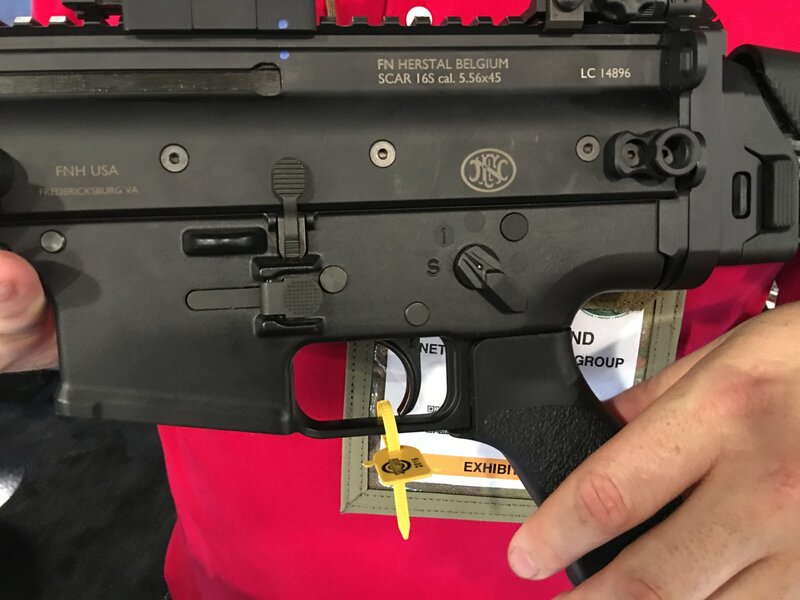 Upon perusing the KDG website, DR also came across the KDG PMM – SCAR Oversized Magazine Release Button and B5 Systems Gripstop, the latter of which also appeared to be on at least one of KDG’s SCAR demo guns at their booth. 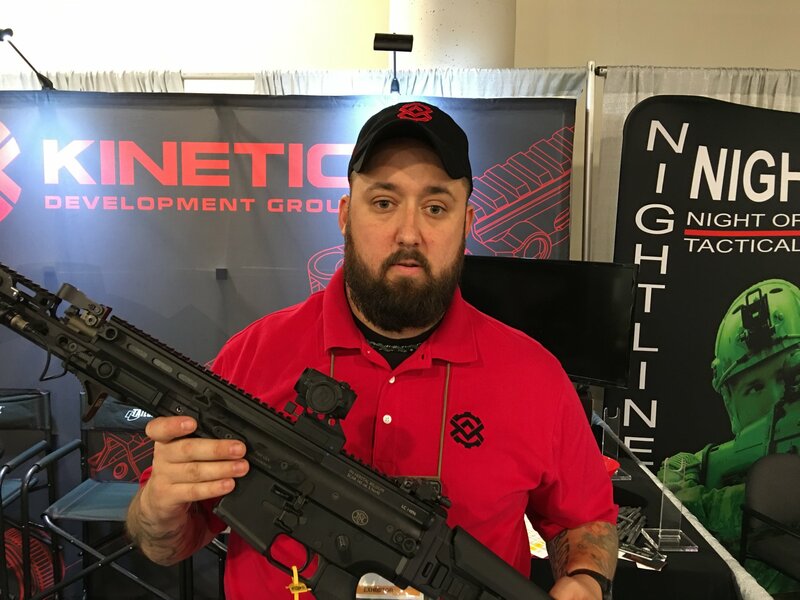 Defense Review is going to see if DR writer/contributor and chief new-product tester Jeff Gurwitch is interested in T&E’ing any (or all) of the Kinetic Development Group products for us. If so, we’ll try to do follow-up piece on them as soon as possible. 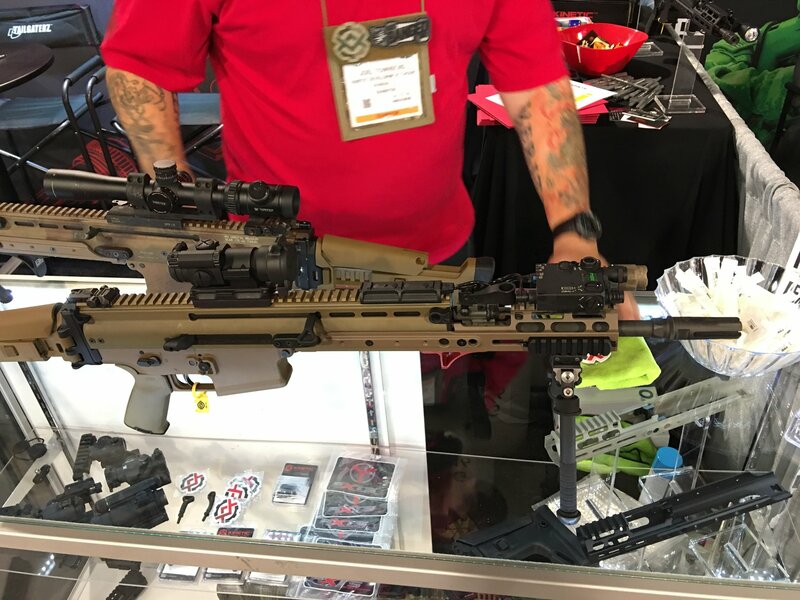 Regardless, Defense Review was impressed with what we saw at the KDG booth, and will be keeping an eye on them, moving forward. Next: High Ready Weapons-Handling Position for Combat/Tactical Shooting Applications and (Direct-Action) Military Special Operations: High Ready or Not, Here I Come!